Saturday morning of my ArtFest adventure brough a workshop with Anahata Katkin. I was happy to have a few people from my previous workshops in my class and I finally got to really connect with Elizabeth. 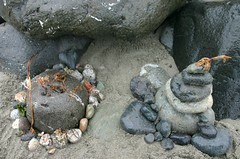 In the morning, we went down to the beach to create nature altars (as I described in my previous post). Here is a picture of mine. After we finished we walked to each person's altar. Each of us shared what we wanted to about creating the altar, what it represented, and so on. It was beautiful. There is so much more I could share about this morning...but for right now, the sacredness of the experience needs to stay there on the beach as I continue to soak it all in and realize all that I have learned. 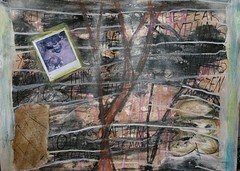 After lunch, we met up again to create a mixed-media piece inspired by our altar. Anahata had us each take a polaroid picture of our altar on the beach so we would have something to work from. I am still not done with this, but here is how it looks right now. The beauty of the fear is that anything you do will be the right thing. To do nothing is to stay in the frozen moment. To do something, to move, is to live. Saturday night brought show and tell and the end of ArtFest. I was able to spend more time with Kelly, talk with a few other new friends, and have one more conversation with Kristi Steiner. I take a breath. My heart has grown. How blessed I am to have had this experience. I am forever changed. senses. artfest day 4, morning.